Glorious Weather To End Q1, 2019! Everyone here at Ultra Cleaning Service has been delighted with the weather over the past few days. 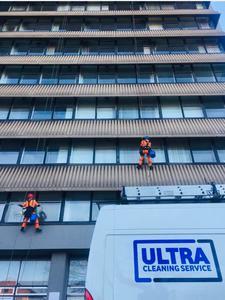 We love window cleaning all year round, however there’s nothing better than high-rise washes in beautiful sunshine! We love Manchester and still get a massive buzz out of maintaining buildings in our incredible home city. That said, long gone are the days where we just cover our immediate region. As well as Manchester, we’ve gained some great new projects across Liverpool, Sheffield and Birmingham. 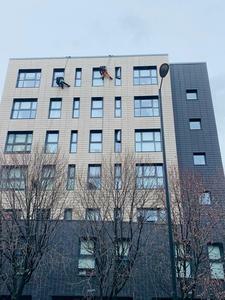 We’ve also just added 3 new rope access window cleaning sites in the city of Preston. It’s all go. Winning more and more work is keeping our team incredibly busy. Just way we like it! Obviously we’re best known for our commercial window cleaning solutions. We want to constantly move things forward though. That’s why we’re delighted to announce another new service offering. As of right now, we’re able to provide eyebolt installation and testing to EN/BS 795 standards. In our game, safety is of maximum importance. When working at height, the risk is huge. That’s why having the correct eyebolts and fixed anchor points installed is crucial. It’s also important to maintain them properly. We’ll be offering a one-stop-shop for new and existing clients who need eyebolt installation and maintenance services. What a whirlwind the first quarter of 2019 has been. New projects, new clients, new locations and a new service offering are just some of our highlights. We can’t wait to see what the rest of the year has to offer. If you want to get in touch to discuss any of our window cleaning services or our brand-new eyebolt installation offering, call 0800 111 4724 or email info@ultracleaningservice.co.uk.